Established in the UK in the early 1980s, DBK Technitherm Ltd. has gained an excellent reputation for the innovative design and the quality of its manufactured electric heating solutions. Such has been the speed of the company’s success, it now boasts customers ranging from smaller niche companies to large international automotive manufacturers. DBK Technitherm benefits from an experienced development team that is able to deliver optimal electric heating solutions based on key technologies. The company’s high quality products include Fan Heaters and Convection Heaters that incorporate safe, dependable self-regulating PTC designs, with power ranges from 5W-800W and Voltages ranging from 12/24VDC to 115-230VAC. Illustrating the diverse nature of DBK Technitherm’s customer base, the company have a wealth of experience in providing thermal control solutions into the security manufacturing industry, including CCTV camera housings and associated electronic housings. Typical DBK security related applications include the de-misting protection and frost prevention of electronic LC's. Within the transport industry, where reliable, cost effective thermal control solutions are required, DBK provide several, safe and reliable solutions. The company are able to deliver designed-in components or retro-fits, covering both mains generated and low voltage supply. DBK have established a proud history of supplying some of the best known names within the consumer products industry. Understanding the price sensitive/quality needs of the white goods and domestic appliances industry has meant that DBK remain a leading global supplier into this very demanding sector. Further DBK product applications include the manufacture a wide range of cabinet based, thermal control products. These products assist in the protection of important equipment against degradation and faults, which could result from adverse levels of moisture or temperature. Typical DBK cabinet applications include telecoms, utility, control cabinets and cabinets with very specific requirements - for example parking ticket machines. Such is the reputation of the design and manufacturing work undertaken by the company, DBK have also gained a wealth of experience in the specification and supply of products for military applications. Baty’s new 14" / 350mm screen, bench projector range has an option of a three lens turret, facilitating instant lens changes without re-calibration. 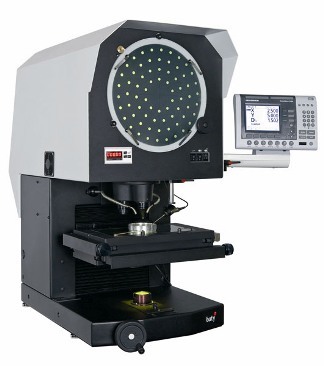 The 2010 SM350 GXL model chosen by DBK incorporates advanced geometric functions allowing the precise and rapid measurement of features such as skew alignment, angle radii measurement, pitch circle diameter and construction of intersect points. Enabling all potential 2010 SM350 customers to specify an optical projector that exactly matches their needs, Baty are able to provide a wide range of optional features including a facility where the focus axis can also be used as a 3rd measurement axis, enabling Z axis height measurements to be taken. An automated measurement system with joystick control and a touch trigger probe for rapid Z axis measurement are also available. Further alternative options include automatic edge sensing, motorised focus axis, a 3-Position turret and lens magnification choices from x10, x20, x25, x50, x100. For more information on Baty's SM350 Optical Projector click here.